Crow Canyon Email sync app is an add-in for O365. SharePoint online doesn’t have built-in functionality similar to Announcements Lists in on-premises where emails sent to a particular address are automatically added to the list in SharePoint. This App plugs this functionality gap by monitoring a mailbox that is accessible via Exchange Web Services and creates the mails received as items in a SharePoint list. This App can be used as a stand-alone product. It is used in Crow Canyon Applications like IT Help Desk for incoming emails to Ticket functionality. When an email is sent to an email address configured in Crow Canyon Email Sync app then these emails get created as Incoming emails in Email Tickets list. Further, Crow Canyon Product App converts these Email Items to Tickets along with other functionality like notifications and auto-assignment etc. 1. What is Exchange Web Service URL in Crow Canyon Email Sync app? Exchange Web Service provides the functionality to enable client applications to communicate with the Exchange Server. It provides access to mailbox data stored in Exchange Online. If you are using in-house or hosted Exchange then please get the web services URL from the concerned team. Please note that this is not same as the Outlook Web Access (OWA) URL. If any settings are modified in Crow Canyon Email Sync settings changes take effect after about 15 minutes. If Multi-Factor Authentication is enabled for the email address which is configured in Crow Canyon Email Sync settings then it does not allow office client application to access SharePoint with regular password. Please refer this article to create an app password. After creating app password, use this email address and password in Crow Canyon Email Sync settings. 3. Can we directly configure Crow Canyon Email sync settings to Tickets? Usually, it takes around 15 minutes for the new settings/changes in email sync settings to take effect. – Sync service creates an item in the Email Tickets list for every new email that comes to the mailbox configured in the Email Sync Setting. The email sync setting has a filter that can be configured which might be blocking creation of items. For example, we might block certain emails to convert as an Email Ticket if subject contains “Test” or “Out of Office” emails. See sample filter screenshot below. Please check the mails that didn’t reach Email Tickets list if verify if they match the conditions specified in the filter settings. 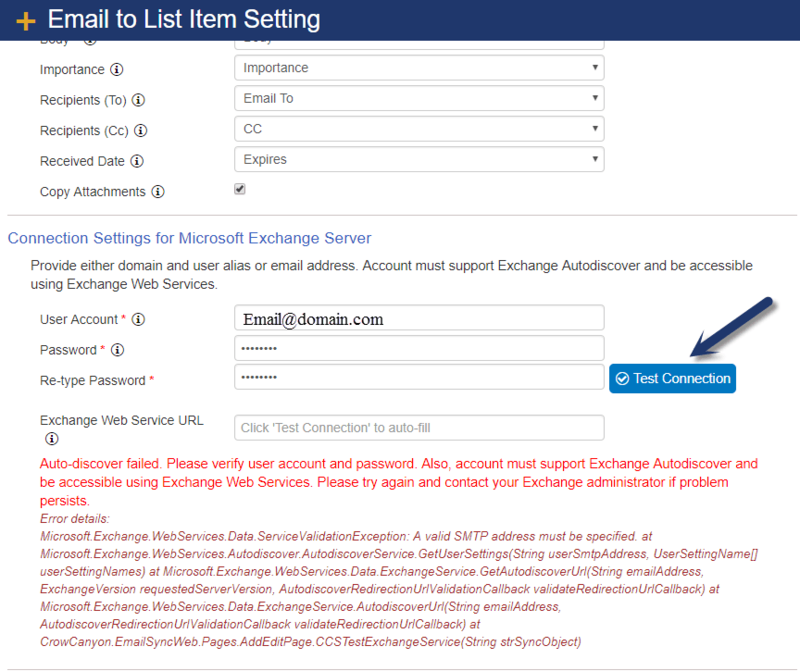 Please check with your Exchange Administrator for the Exchange Web Service URL in case you are not using O365 exchange. Specify the internal Exchange web services URL (not OWA URL) and click on test connection. Also, please make sure you are able to login to the exchange with the User Account specified in the email sync settings. Though email sync will get configured successfully, it won’t sync the items in certain cases. This can be in cases where the Inbox folder in the mailbox contains very large number of items (50K+). In the first run after configuration we don’t sync any existing item, but we need to go through all existing items to determine the checkpoint from where to start syncing mails from next run onward. With very large number of items, this first sync times out and is unable to determine the required checkpoint. In this case, move the Inbox items to a different folder and see if sync begins to work. Please note email sync runs every few minutes so it may take some time before you start seeing the results. Also, only new emails after successful checkpoint are sync’d (after first sync). So you need to send a new mail after some time to see if service has started working.